This March 5, 2018, file photo shows Gregg Popovich, coach of the San Antonio Spurs, during a game against the Memphis Grizzlies at the AT&T Center in San Antonio, Texas. The wife of San Antonio Spurs coach Gregg Popovich has died. She was 67. 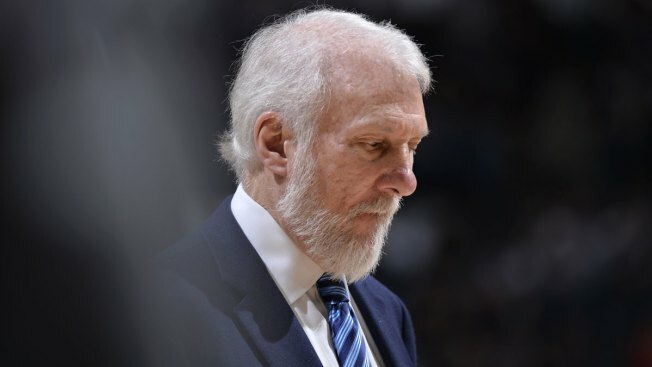 The Spurs confirmed Erin Popovich's death Wednesday. The team didn't provide further details. "We mourn the loss of Erin," Spurs general manager RC Buford said in a team statement. "She was a strong, wonderful, kind, intelligent woman who provided love, support and humor to all of us." The Popovichs have two children and two grandchildren. They met at the Air Force Academy in 1970s when he was an assistant coach for the Falcons. Erin's father, Jim Conboy, was Air Force's head athletic trainer. Gregg Popovich has coached San Antonio since 1996, leading the Spurs to five NBA titles. San Antonio will face Golden State on Thursday night in Game 3 of their first-round playoff series. Popovich ran the Spurs' practice Wednesday. They Warriors lead the series 2-0. LeBron James was made aware of the death shortly after the Cavaliers’ win over the Pacers in game two of their playoff series.